A limited but lovable analogue synth that provides kicks with serious attitude. Hands-on design. Retro style and sound. It's got balls. Expensive for a bit of kit that only does one job. Noise oscillator and FM features don't seem that useful. The kick Lancet's retro style certainly makes it an attractive looking box. There's no denying this box can output some deep bass if required. By medical definition, a lancet is a cutting instrument with a double-edged blade, so it remains to be seen whether this specialist analogue module can produce cutting-edge kicks. While it's possible to create a kick drum sound on most analogue synths, there's a lot to be said for having a box that's tailor-made for the job. As long as the basic tone is right and options are presented in a simple way with enough room for a range of variations in style, we have a machine that will out-perform a general synth. As is common to the majority of Vermona gear, it's all analogue circuitry inside, housed in a metal case with the distinctive '70s brown and beige colour scheme. The stylish retro finish is absolutely top-notch; the corners are folded flush and smooth, and there are no unsightly screws to detract from the impeccable styling. A quick tour of the unit reveals two rows of controls on the top side. The first row is for adjusting the waveform parameters: this includes essentials such as decay time, pitch, bend range and bend time. Expanding on this, we find two additional controls for FM Frequency and FM Intensity, which are unusual for kick drums. These parameters are all for editing the single oscillator, which provides sine and square waves. The waveform can be blended from one to the other using the Wave dial on the bottom row. You can also add white noise to the mix and boost the attack transient to give it more of a click at the front. You've got to give Vermona kudos for adding a 'Balls' knob. We expected it to be some kind of over-the top overdrive, but it's much more subtle; it seems to thicken up the fundamental frequency and mellow the upper mids, helping the click to sit in the mix better. There are several ways to get a kick out of the box. The simplest way is to press the Trig button on the front panel: tapping once produces a single kick, but if you hold it down for a couple of seconds, it turns Latch on and fires off a regular 4/4 kick at around 100bpm. The unit is equipped with MIDI in and thru, so you can choose to trigger it through a digital sequencer. The kick is mapped to MIDI note C1 as standard on channel 1, and it responds dynamically to note velocity. If you are used to Old Skool analogue systems, there's a 5V gate input that can be used to trigger the kick at a fixed volume, or you can choose one of the three dynamic modes to get changes in volume. To switch the mode, you need to send a MIDI CC 84 message with a specific value between one and four. We measured the pitch dropping as low as 20Hz, so there's no denying that this box can output deep bass if desired. We didn't find the noise oscillator or FM features too useful for kicks, but they do help for snare-type sounds. We did find ourselves craving fewer linear envelopes, tighter decay and the possibility of different curves for the pitch bend to vastly expand the range on offer. Sound-wise, it's got that real analogue tone: deep, warm and furry. 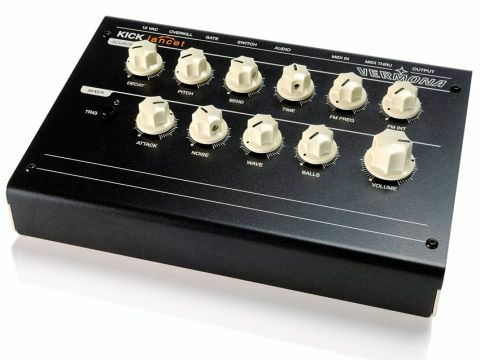 It does a range of useful kicks that are different to both 808s and 909s. It's not cheap, and it only does one thing, but live on stage or in the studio, this is probably the easiest and fastest way to get high-quality analogue kicks.